Vinten Vision 250 Fluid Head (Gray) 4-Bolt Base Camera Mounting Plate. Please see description & photos. 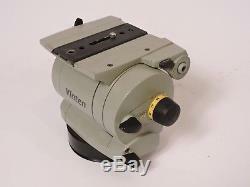 Vinten Vision 250 Fluid Head (Gray). 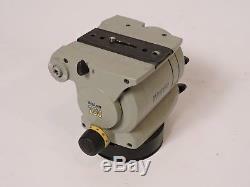 Vinten 4-Bolt Base - for Vision 250 Fluid Head. 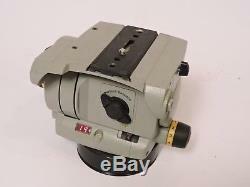 Panoramic head in good working and cosmetic condition. All the clamps work properly. It was used carefully in the rooms. There are minor signs of using a scratch that does not affect performance. A panoramic head can perform all functions for shooting. The class-leading Vision 250 is designed to support cameras complete with viewfinders, prompters and pan bar controls and is becoming the standard in new studio production. With the choice of easily changeable, spherical or flat bases, the Vision 250 can be mounted on any pedestal or tripod, making the Vision 250 the head of the most flexible products in the range. Of the balance system, allows precision balancing of the pan and tilt axis, that allows following the action becomes totally insignificant. The Vision 250 also includes illuminated drag controls and a digital counterbalance readout, providing simple and repeatable camera set-up in any lighting situation. TF drag mechanism Perfect Balance throughout 180 ° tilt range. Digital balance readout displays Extensive operating temperature from -40 ° C to + 60 ° C; Load capacity of 72.8 lbs. Ready to answer your questions at any time. 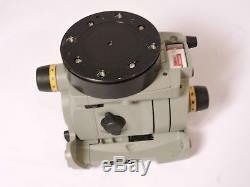 The item "Vinten Vision 250 Fluid Head (Gray) 4-Bolt Base Camera Mounting Plate" is in sale since Saturday, December 22, 2018. This item is in the category "Cameras & Photo\Tripods & Supports\Tripod Heads". The seller is "bizkino15" and is located in Moscow. This item can be shipped to North, South, or Latin America, all countries in Europe, all countries in continental Asia, Australia.